On a 200km brevette this weekend, I met up with a rider friend of mine and it was the first time I have seen his new bike. 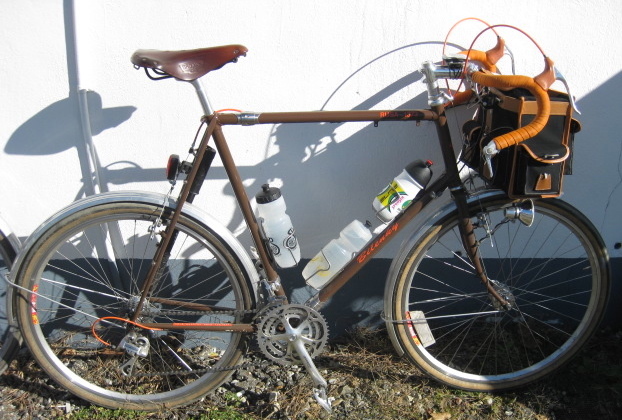 This Bilenky was built as the ultimate randonneuring bicycle. 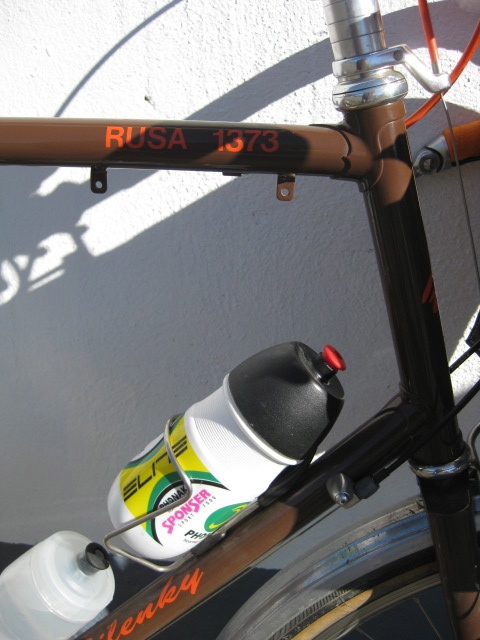 The rider has logged many miles and had gone through numerous bikes contemplating what his ideal bike would be. This is what he came up with. 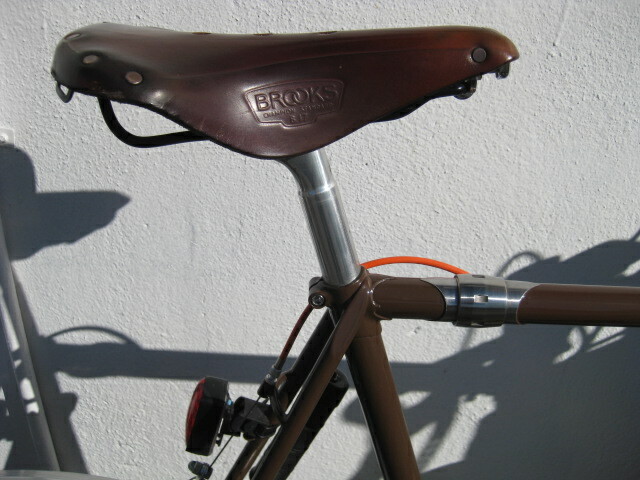 650b wheels, barend shifters, non-aero brake levers, numerous braze-on eyelets for racks and lowriders, and S&S couplers. One funny braze-on is for the number plate for his PBP placard, he was unable to attend this year, but there is always 2015. I really like the brown and orange color scheme. could have been this machine kills miles/kilometers. Who knew that bike-builders needed editors? It could have been, but it isn't because we can take some liberty with the allusion. The key is not the “killing”, it's that the object has more than just a superficial meaning. Steve Earle's character in 'Treme' has a guitar that says “This machine floats”, so the slogan is a gently humorous declaration of defiance against those who might doubt your contribution to the war effort, or doubt your patriotism, or against those who are indifferent to your struggle against adversity, or even those who don't fully understand what a bike like this can let you do. 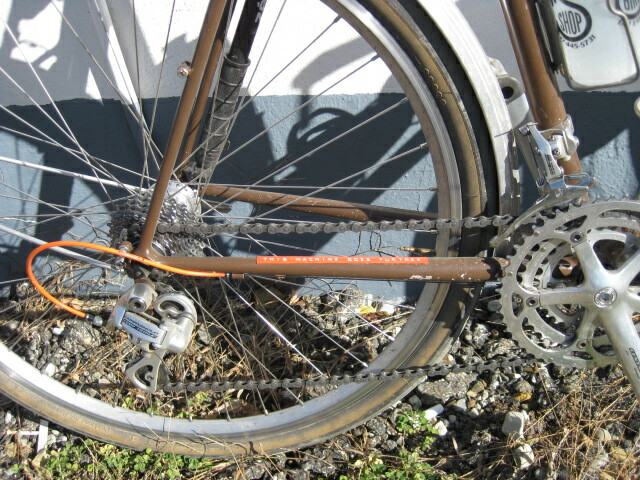 Also wanted to point out that I wanted non-aero levers only because they were going on Nitto Randonneur bars. That combo works well together, but for me the jury is still out on whether this is the ideal setup for rides longer than twenty-four hours. Normally I like the long, flat ramps of the Noodle bar with big Campy-style lever bodies. After it warmed up a bit, Saturday was a beautiful day for a ride . . .
saturday was a great day and Goon your bike is awesome. I'm glad I lived up to your randonneur code 😉 (that a randonneurer should be able to wake up on any day and be able to complete a 200k brevette in the time allowed). on a PA Randonneurs ride, nonetheless. Then it really isn't a reference to Woody Guthrie's quote (as stated) or it is *very* loose one. Your term allusion is appropriate. I think it's your own almalgam and it's a good one possibly inspired byt Guthrie Earle. And it's an excellent bike, I'm picking on it because I'm envious. I am happy We resided as much as your own randonneur signal; )#) (that the randonneurer will be able to awaken upon any kind of day time and then total the 200k brevette within the period permitted). on the PENNSYLVANIA Randonneurs trip, nevertheless.